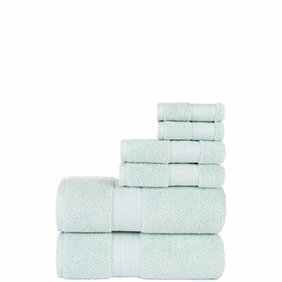 Renew your daily routine with just-in towels & bath accessories. We have everything you need, whether you’re adding a new shelving unit or reorganizing with a few pretty countertop jars. Bring that spring feeling of freshness & light to your bath with a plush new mat & towel set. Chic counter organizers are a must—they’ll give your daily routine an energy boost. Between bathing, shaving, brushing your teeth, putting on makeup and everything else you do in the bathroom, you end up spending a good deal of time in this room each and every day. In addition, you sometimes need to allow guests to use your bathroom. Make your bathroom look like the showcase that the rest of your home is by purchasing the right accents and accessories. Thanks to our Every Day Low Prices, you can do this and save money at the same time. Here are some important decorative accessories to consider when you're looking to revitalize your bathroom. The shower or bathtub (or both) is the focal point of every bathroom. However, not everyone wants to be able to see it. Additionally, when you're using the shower, it's important to keep water from seeping or spraying into the room, getting on the floor and creating puddles where others might accidentally slip. Shower curtains make it possible to contain water where it needs to stay. They also provide privacy while you're showering and bathing and can even add a decorative touch to your bathroom. Shower curtains and liners are available separately or as part of a set, which also includes hooks as well. If you choose a cloth curtain, a vinyl liner protects the curtain from getting wet and hangs behind the curtain. Look for shower curtains that have a vinyl liner or are made of vinyl themselves. Designs that have liners can be made from many materials, include cotton, polyester, linen, plastic and polyester or cotton blends. Although the liners tend to be white, off-white or clear, shower curtains come in a multitude of colors, patterns and themes. When choosing a shower curtain and liner, make sure you know the width and length you need. Our shower curtains are available in sizes up to more than 90 inches tall and from less than 60 inches to more than 100 inches wide. 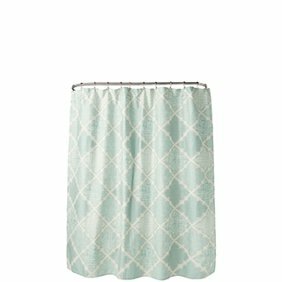 To hang the shower curtain and liner, you'll need a shower curtain rod. 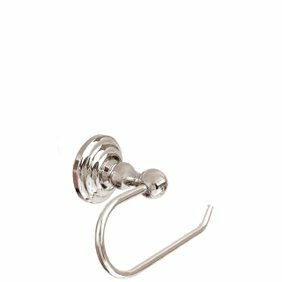 These are adjustable so that they can mount snugly between the shower's or tub's walls. They're typically designed with springs that create tension to mount each rod between two walls, and they can either be straight or curved to match the lines of your tub. There are several different finishes available, including chrome, stainless steel, nickel, pewter and brass. There are many colors available, including white, black or silver. 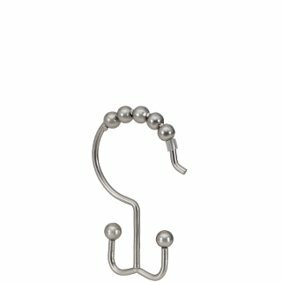 Hooks are essential as well, with most being plastic, although some are metal. Most are circular, but some are decorative and come in various shapes. Hooks thread onto your curtain rod, and you attach the curtain to the rod by hanging it on the hooks. Most bathroom floors are tile or vinyl. They can get slippery when you're getting out of the bath or shower and feel cold in the middle of the night. 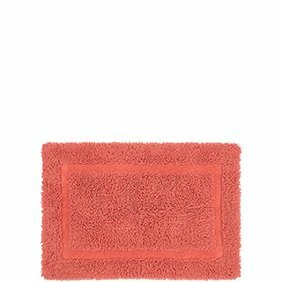 Bath rugs are plush rugs that provide a great deal of comfort to your bathroom floor by keeping it dry and warm. 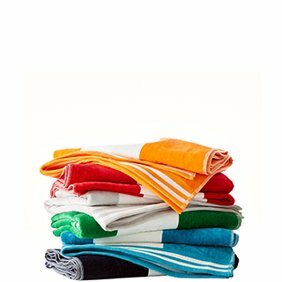 They're typically available in cotton, polyester, nylon, microfiber and fabric blends. 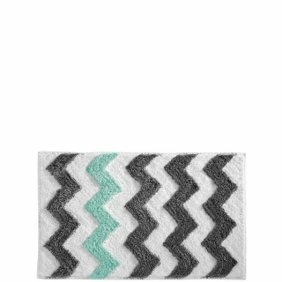 You can also find them in many colors and patterns and either individually or in sets that include a matching rectangular rug, contour toilet rug and toilet lid cover. Choose rugs made of synthetic materials for the area right outside your bath or shower they dry faster than cotton designs. Cotton rugs work well in front of your sink. Bath mats go inside the tub or shower to prevent slippage. Many bath mats are rubber with suction-cup grips, but there are also designs made of bamboo, foam and other materials. Although the principal items in a bathroom are the bath, shower, sink and toilet, there are other pieces that complete the room. These include cabinets, mirrors and shelves. Many cabinets hang on the wall, but some are freestanding, too. medicine cabinets hang above the sink, and there are others that hang above the toilet. Nearly all are white or off-white to match most bathrooms' decor, but other colors are available to suit varying tastes. Most medicine cabinets have mirrors, but it's possible to hang a mirror on the wall itself instead of mounting a cabinet. Mirrors are usually plain or accented with lights. For shaving purposes, there are fog-free mirrors that attach to the walls or door of a shower. If you have limited space in your bathroom, you can add low-profile wood or metal shelves, or bathroom organizers, that are freestanding or perch above or around a toilet to save floor space in the room.